The Laird Phantom Fin antenna provides an excellent solution for the transportation and public safety markets, as it integrates a wide range of frequencies into one aerodynamic housing. 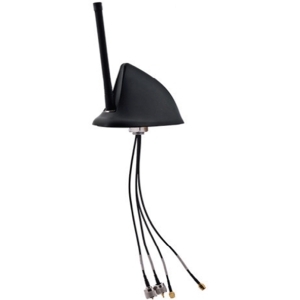 This high performing Permenant Hole Mount antenna is recommended for use on cars, trucks, and mobile monitoring equipment and M2M applications requiring an M2M antenna with GPS and Cellular communications. . It must be mounted on a metal surface (minimum 8" diameter) to function properly and is not recommended for home use. Permenant Hole Mount - Includes rubber gasket for a tight seal. Developed specifically for M2M installations, the weBoost Signal 3G M2M Booster Kit is based on the same field-tested, market-proven technology that powers Wilsons cellular signal boosters for the consumer market.